Pet urns offer a personal connection with your pet even after passing. Only an animal lover can understand the sadness of losing a pet. We view our pets as part of the family, with personalities and charms as distinct as any playful child or eccentric aunt. So, when a pet dies, grief is often just as real as if a human family member had passed away. 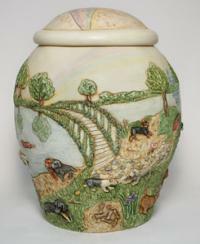 Pet urns are one way to help deal with sorrow in the loss of a pet. As in the death of a friend or relative, preserving the memory of a pet by choosing an attractive pet urn to hold the cremated remains of your pet is another touching way to memorialize the four-legged friend who brought so much joy to your life. 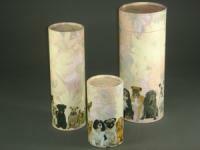 Like cremation urns for people, pet urns come in an assortment of designs, materials and sizes. 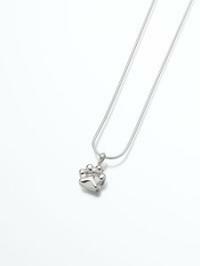 Etched two Paw Print in Pewter for a small to mid size dog. JALRHO8 for larger dogs up to 60 lbs. Featuring the rainbow bridge poem as an insert. The urn lovingly displays elements of the heavenly environment described within the treasured rainbow bridge poem. 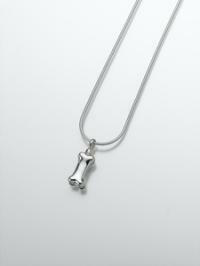 Owners will identify with the familiar dog behaviors depicted on the piece. Size 6x5.